Wedding photography is one of the most important aspects of your wedding planning. After the big day is over, the cake will be eaten, the wedding dress will be kept in a closet, and the flowers will be thrown away… Everything you are left with will be the precious wedding photos, that have captured all those beautiful little details that will make you smile when you look at them even after tens of years have passed from your wedding day. Choosing a wedding photographer is not something that should be put towards the end of your to-do wedding planning list. In fact, as most of the good wedding photographers are taken well in advance, you should consider hiring your wedding photographer as early as possible. Just like anything else, always choose quality over quantity as one good wedding photographer is way more than three or four inexperienced ones. You definitely shouldn’t make a detailed list of all the shots you want taken (after all, it is the professional wedding photographer’s job to propose the most appropriate shots for your specific wedding). But a short list of preferences will make it easier for the wedding photographer to make sure he’s captured all the things that matter to you in the way you want them (like black and white shots, a macro of your ring finger tattoo, etc). It’s the little details that either make or break a brilliant photo. Try to think of any details that have the potential to ruin your wedding photos and make sure to get them out of the way. For example, if you need to stay hydrated during the shoots, make sure you drink water from a nice glass as a plastic bottle of water never looks in place next to a fabulous wedding dress. 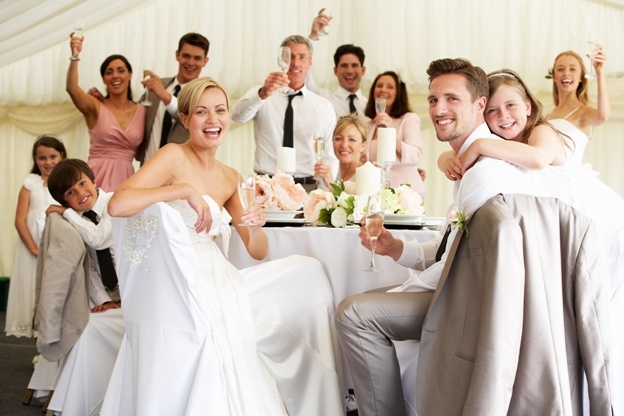 This may be a really difficult task as on your wedding day all of your wedding guests will want a shot with the bride and groom (together and separately). Then, there are the family photos: one with parents; one with siblings only, one with parents and siblings, one with extended family (bride’s side), now groom’s side… The list is endless! In order to deal with this, it’s a good idea to ask a close friend (a bridesmaid) to talk to the wedding guests and ask them to wait for the reception to get these group portraits done. Your wedding photographer will surely thank you as great pictures take time and that’s something you cannot make more of on such an event-dense day as your wedding! This is a piece of advice any wedding photographer would want you to follow. Your wedding photographer will be with you on your wedding day for many hours, wearing tons of heavy equipment and sweating to get the best shots of you and your bridal party. The least you can do is regularly ask him if he needs a glass of water or a minute to have a break. Also, make sure you let them eat while you do – this will also provide you with all the photographer’s time as you probably won’t need pictures of you while eating, right?